The benefits of natural progesterone are well known when it comes to dealing with osteoporosis, but adding another natural ingredient could also boost your bone health. Although this new research focused on postmenopausal women, its findings do offer a benefit to people of all ages as this condition can affect both men and women at any time of life. In the first five to seven postmenopausal years, women are at risk of losing bone at a rate of 3 to 5 percent per year but what is less well known is that around the age of 65, men start losing bone with the same rapidity as women. Bahram H. Arjmandi, Professor and Chairman of the Department of Nutrition, Food and Exercise Sciences in the College of Human Sciences at Florida State University researcher has spent a career testing for foods that might help improve bone health. His researches have included figs, dates, strawberries and raisins, but apparently none of them come anywhere close to having the effect on bone density that dried plums, or prunes, have. He said that although all fruits and vegetables have a positive effect on nutrition, in terms of bone health, this particular food is exceptional. The research by Florida State and Oklahoma State University tested two groups of postmenopausal women. Over a 12-month period, the first group, consisting of 55 women, was instructed to consume 100 grams of dried plums (about 10 prunes) each day, while the second control group of 45 women was told to consume 100 grams of dried apples. All of the study’s participants also received daily doses of calcium (500 milligrams) and vitamin D (400 international units). The group that consumed dried plums had significantly higher bone mineral density in the ulna (one of two long bones in the forearm) and spine, in comparison with the group that ate dried apples. This, according to Arjmandi, was due in part to the ability of dried plums to suppress the rate of bone resorption, or the breakdown of bone, which tends to exceed the rate of new bone growth as people age. Interestingly, they did no comparison with bio-identical natural progesterone, which would have actually shown bone growth, not just the slowing of the bone breakdown rate. That would indeed have been an interesting comparison, but as the research was sponsored and funded by the U.S. Department of Agriculture ad the California Dried Plum Board that should be no surprise. However, it will certainly do no harm to add some prunes to your breakfast muesli for its added protection and health benefits for your digestives system too. The suggestion from the researchers is to start eating two to three dried plums per day and increase gradually to perhaps six to 10 per day. As an aside, I would suggest fresh plums as opposed to dried (i.e. 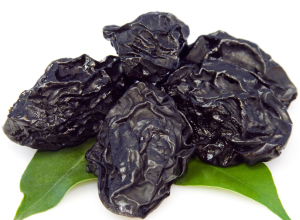 prunes) in that sort of dosage for those with any sort of insulin resistance/blood sugar problems/excess weight.